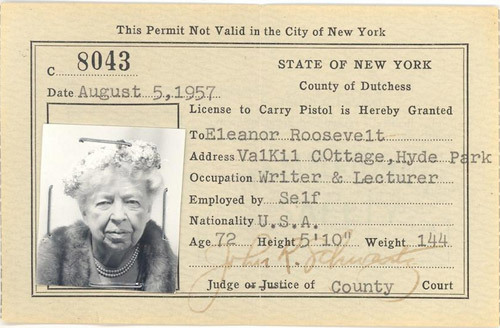 Eleanor Roosevelt’s gun permit. Look at that broad. Spectacular. Jamie Oliver’s Drinks Tube. This new YouTube channel features videos on beer, wine and how to make craft cocktails at home, including how to garnish your drinks. I’m in. “How a Real Corpse Ended Up in a California Fun Park Spookhouse.” This story has it all: Old West justice, a shifty carnival owner AND The Six-Million Dollar Man. Arya and The Hound. Their closing scene was my favorite in last Sunday’s Game of Thrones premier, “Two Swords.” Also, “Arya and The Hound” would make a great band name. Someone, get on that. 20 Magical Tree Tunnels. The world needs more of these. This story about a surfer who helped his friend’s paraplegic mother ride the waves by taping her to himself with duct tape. People are awesome. This story about the Toto Washlet S350e, a “Japanese wonder toilet.” It has a remote control! Why are we still using these porcelain-covered pee buckets when we could be treating our hindquarters to a $1,700 luxury? It keeps me up at night. Trader Joe’s Simply the Best Trek Mix with cashews, almonds, pineapple, cranberries and tart cherries. I was there looking for cheap pistachios, but then this guy walked up and started loading bags of this trail mix into his basket, so I had to try it. Why do they only sell it by the pound? So good. Previous Post Whole30 Days 27-30: Boom! I made it.